We haven't had these in a while because Jon isn't crazy about the canned enchilada sauce. So what's a girl to do? Make her own, of course! I used a recipe for sauce by Emeril with just a few changes, noted below. In a medium saucepan heat oil, add flour, smoothing and stirring with a wooden spoon. Cook for 1 minute. Add chili powder and cook for 30 seconds. Add stock, tomato paste, oregano, and cumin. Stir to combine. Bring to a boil, reduce heat to low and cook for 15 minutes. The sauce will thicken and smooth out. Adjust the seasonings. This is my own recipe. Cook chicken in pan with the spices. Once done, shred with 2 forks. Sometimes I just throw it in the food processor quickly if I'm in a rush. When you are ready to cook, heat a large pan. Add onions, green onions, and all peppers. Saute for a few minutes. Add the chicken and stir. Add the cream cheese slowly, blending everything together. Add the salsa and corn. Tonight I only used a bit of enchilada sauce instead of the salsa. Stir over medium heat until you have a creamy mixture. 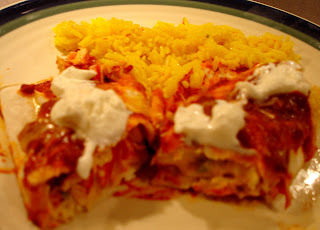 Pour a thin layer of enchilada sauce into a casserole dish. Spoon some of the mixture into the middle of a tortilla shell. Roll up, place in a casserole dish seam side down. Continue until you are done with the mixture. I usually get six nice sized enchiladas. Top with some of the sauce and cheese. Bake on 375 for about 20 minutes or until hot and bubbly. I love having these with Mexican rice. They are great the next day, too! 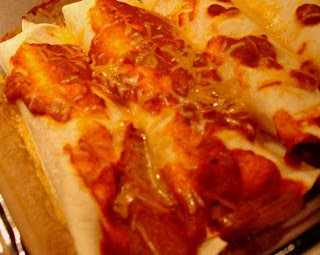 Mmm I'm making enchiladas this week too. Yours look great! I can't wait now. Thanks for posting! I've been wanting to try making my own enchilada sauce!